Presented on January 14, 2014 at the University of Washington Medical Center, Seattle, WA. Chronic (or long-standing) pain is a common problem for people living with spinal cord injury, and it is often very difficult to treat. In this forum video, two UW Rehabilitation Medicine clinicians discuss the different types, causes and potential treatment options for chronic pain. In Part 1, Medical Approaches, Deborah Crane, MD, MPH, assistant professor and rehab physician at Harborview, reviews medications, surgical options, injections, pumps, massage, and other treatments. In Part 2, Self-Management Techniques, Dawn Ehde, PhD, professor and rehab psychologist, discusses different self-management strategies for decreasing and coping with chronic pain, including relaxation, pacing and hypnosis. Watch the video below or read the report. Hear what others with SCI do to manage their chronic pain so they can carry in with life! By Deborah Crane, MD, MPH, Assistant Professor of UW Rehabilitation Medicine and SCI physician at Harborview Medical Center. 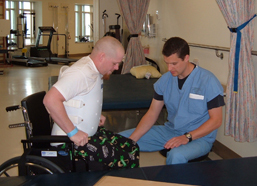 Pain is very common after spinal cord injury. Statistics vary, but generally about four out of five people with SCI report significant chronic pain. Of those, about one-third report the pain interferes with their quality of life and their daily activities. Pain can be either nociceptive or neuropathic. Nociceptive pain means the nerve endings that are intact are actually being irritated by some sort of noxious or irritating stimulus and you are receiving true pain signals. Musculoskeletal and visceral pain are both nociceptive. Neuropathic pain is caused by abnormal communication between the damaged nerves in your spinal cord and the pain centers of your brain. Musculoskeletal pain is usually a dull or achy pain felt above your level of injury where the muscles are innervated normally or have not been affected by your spinal cord injury. It is usually triggered or worsened by movement. Back and neck pain. People with SCI often develop curves in the spine, such as scoliosis (sideways curve) or kyphosis (rounded back), and this abnormal posture can become uncomfortable over time. Lack of core strength due to paralyzed muscles often leads to muscle imbalances and using shoulders to maintain posture in a way that becomes uncomfortable. Overuse from pushing your wheelchair or using a walker over time can lead to arthritis of your shoulder joint or rotator cuff tears. People with weak trunk muscles often lean on their elbows to hold themselves upright, causing painful bursitis or arthritis. The ulnar nerve of the arm can become pinched at the elbow over time, causing pain and weakness. Hands and wrists. Manual wheelchair users put a lot of strain on the carpal tunnel area in the front of the wrist (carpal tunnel syndrome). Exercise. Exercise can be effective in improving pain, and PTs and OTs can design an exercise program specifically for your needs. Activity modification. Reducing or changing the way you do things can allow the painful area to rest. For example, if you are performing 12 transfers a day while you do errands all over town, think about consolidating some of your activities to do fewer transfers. 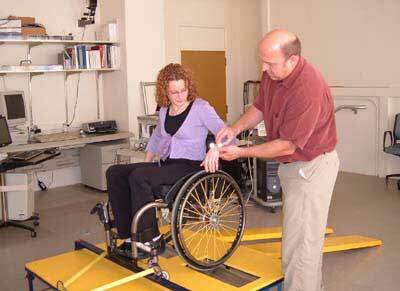 Wheelchair evaluation . If you are using a manual wheelchair and having musculoskeletal pain, a proper wheelchair fit is vitally important. A good fit enables you to have correct posture and support for your pelvis and back and to use correct body mechanics while propelling your chair. Weight control. The less weight you have to haul around, the less strain you put on your upper body. It’s hard to lose weight when you are limited in what activities you can do, but your therapists can help you find some options. Injections. Cortisone injections can be helpful for temporary pain management. Remember to rest your upper limb immediately after getting an injection to avoid the possibility of a tendon rupture. Surgery. Surgery is sometimes an option when other methods don’t works. Keep in mind that you may need to completely rest the affected limb for several weeks and even months after major upper limb surgery. With one arm out of commission, you may need almost full time help or a stay in a nursing facility while healing. Consider a power wheelchair. Manual wheelchair users are often reluctant to switch to a power wheelchair. But if pain has reduced your mobility, switching to a power chair, at least part of the time, can actually increase your participation in activities you enjoy. Some guidelines say that if you get surgery for an upper limb issue you should use a power chair for the future because you're at risk of more upper limb injury. This refers to pain in the abdominal area. It is often described as dull, achy, or crampy pain that comes and goes. It can be vague and hard to describe, especially if you don't have normal sensation in that area. Visceral pain is caused by some sort of abdominal problem that needs treatment, such as constipation, kidney stones, ulcers, appendicitis, bladder stones, gallstones, or a gastrointestinal kind of virus. In contrast to nociceptive pain, neuropathic pain is caused by abnormal communication between the damaged nerves in your spinal cord and the pain centers of your brain. The pain is often described as pins and needles, burning, throbbing or stabbing. It can be at the level of injury, where your sensation or your strength changes, above the level of injury, or below the level of injury. Usually there is not a specific trigger for the pain, and the pain is often fairly constant. Neuropathic pain is complex and usually requires a combination of treatment approaches to manage. The first step is always to see if there is any medical complication causing the pain. Your doctor can help with this. Acetaminophen (Tylenol) is often overlooked because people may not think it’s strong enough, but for many patients it is helpful, especially in combination with other medications. Antidepressants. There are two major types commonly used for nerve pain. TCAs or tricyclic antidepressants -- most commonly amitriptyline and nortriptyline. Major side effects are dry mouth, constipation, and urinary retention, which for some people are intolerable. Otherwise it's pretty safe, and for many people it is very effective. Serotonin norepinephrine reuptake inhibitors (SNRIs) have been shown to be effective in treating nerve pain. Common examples are venlafaxine (Effexor) and duloxetine (Cymbalta). The main side effects potentially are GI or stomach upset, or high blood pressure in some people. Anticonvulsants. Seizure medicines such as gabapentin and pregabalin (Lyrica) also work well against nerve pain. First-generation anticonvulsants like carbamazepine (Tegretol), phenytoin (Dilantin), and valproate (Depakote) can be effective. Some of these medications require periodic blood tests. Second generation anticonvulsants are more common because they don’t need such monitoring. These include gabapentin (Neurontin) and pregabalin (Lyrica). The main side effect is sedation, but otherwise they are well tolerated. NSAIDs or nonsteroidal anti-inflammatory drugs such as ibuprofen (Advil), naproxen (Aleve), and celecoxib (Celebrex) are not frequently use for nerve pain, but they sometimes can be helpful in combination with other drugs. Side effects are mild and some people may get stomach upset; however, taking too much for too long can damage kidneys. Most people with SCI had this type of medication when they were first were injured and still in the hospital. These drugs come in either long-acting (methadone, morphine, oxycodone, and fentanyl, lasting 8-12 hours) or short-acting (morphine, oxycodone, hydrocodone and hydromorphone, lasting 2-4 hours) formulations. Short and long-acting medications are often prescribed together, to combat the spikes of intense pain that break through the long-acting dose. Narcotic medicine slows down everybody's gut, so whether you've got spinal cord injury or not they're going to make you constipated. Since many people with SCI already struggle with having regular bowel movements, narcotics can make it much worse. Anyone who takes narcotic medicines for a long time will develop some physiologic dependence. That doesn't mean you're a drug addict, but rather that your body has become accustomed to that medication, so that if you stop abruptly you will have some withdrawal symptoms. Sleepiness is a common side-effect of narcotics. This is the idea that your body starts to need more and more of the medication as time goes on in order to get the same benefit. So if 5 milligrams of a narcotic really took care of your pain, after a couple months you may need to increase that to 10 milligrams. And this continues: after a few months on 10 milligrams, you’ll start needing 15. That’s one reason why long term use of narcotics can be a problem. This is a risk if you do not take narcotics a prescribed. Medications that you rub onto your skin can be helpful for some kinds of pain, but they are only practical for small areas of the body. Capsaicin. The active ingredient in these creams comes from chili pepper. Capsaicin tends to work better if you use it multiple times throughout the day. Lidocaine is a numbing medicine similar to what the dentist gives you in a shot form. Lidoderm patches are stickers with the lidocaine medication impregnated in them. They can be very expensive and are not covered by many insurance companies. Diclofenac or voltaren gel is an anti-inflammatory gel. Marijuana (cannabis) has been found to be effective in reducing nerve pain and spasticity in some studies of people with SCI and other disabilities. 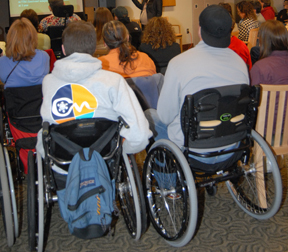 Go to “The Use of Medical Marijuana to Manage Symptom Burden in Spinal Cord Injury” at http://sci.washington.edu/summit2014/medical_marijuana.asp for a comprehensive discussion about medical marijuana for SCI pain. Surgery for nerve pain is not common but may be helpful in a few specific cases, such as a pinched nerve in your spine (nerve root compression) or a peripheral nerve injury such as an ulnar nerve injury at the elbow or carpal tunnel syndrome. Likewise, syrinx formation (a cyst in the spinal cord) or nerve root tethering (nerves stuck in scar tissue) may require surgery. Acupuncture is considered a neurostimulatory technique in which needles are inserted in various points in the skin. While some people say it works well, research has not found it to be effective. It doesn’t really have any negative side effects, however, and may be worth a try. Massage therapy. There is research data that shows people with SCI are using massage as a frequent pain treatment and finding it effective. While some insurers do pay for therapeutic massage, others unfortunately do not. A TENS unit. TENS stands for transcutaneous electrical nerve stimulation and uses electric current delivered through patches applied to the skin. TENS is often most useful for pain in a specific area, such as SCI pain at your level of injury, radicular or nerve root type pain, or musculoskeletal pain. Heat and ice can be helpful for individuals with muscular pain. Do not to apply heat or ice to areas of your body that don’t have normal sensation, however, because you can get burns or frostbite. By Dawn Ehde, PhD, Professor of UW Rehabilitation Medicine and rehab psychologist at Harborview Medical Center. Most pain in SCI is chronic, meaning that it is long-lasting and fairly continuous. You are the one who's dealing with it every day, and you are therefore the expert on it. In self-management the important question is not “How or why did I get the pain?” but rather “What can I do to manage my pain so that I can get on with my life?” The main goal of self-management is helping people get back to participating in life and doing the things they want to be doing despite the pain. While medical and rehab interventions are certainly important in managing pain, research has shown repeatedly for more than 50 years that pain is much more than just a medical problem. It affects and is affected by all aspects of a person’s life—feelings, relationships, behaviors. It is best understood as a biopsychosocial phenomenon, meaning physical, emotional and social factors all play a role in the way you experience pain. There are some very concrete practical self-management skills that can help you manage chronic pain. One of the most important things in taking back your life when living with pain is to set a goal. Make sure your goal is both manageable and realistic. On a scale from 1 to 10, how confident are you that you can reach your goal? A rating between 0–6 means that the goal is too hard and needs to be broken down into smaller pieces. A rating of 7 to 10 means it’s a good fit. Evaluate results. Did you reach your goal? Another goal-setting approach is to make a statement specifying what you will do, how often, which days, what barriers you anticipate and how you will deal with them. This ensures that your goal is tangible and doable. Increasing activities which are enjoyable, meaningful, or pleasurable. Increasing participation in activities consistent with your values and goals. “Anti‐depressant” and “anti‐pain” (i.e., reinforcing, valued, enjoyable). Rather than do a “chore” that you don’t enjoy, choose something enjoyable—it is more likely to distract you from your pain. Schedule your activity rather than waiting until you “feel better or feel like it.” Schedule it and follow through like you would a doctor’s appointment, and don’t cancel even if you don’t feel like it at the time. Avoid doing too much when you do feel good. Don’t go out for a whole day if you’ve been staying home for weeks due to pain; just go out for an hour or two. Overdoing can set you back, and you can get in a cycle of crashing after overdoing, then feeling tired, cranky, discouraged and less active. Set time limits on new or increased activities. Plan the activity to allow rest or relaxation interspersed with the activity. Use an experimental approach. Tell yourself you’re going to do an activity and see what happens. You might be surprised to find that getting active doesn't actually make your pain any worse, or even if it does the value of whatever else happens outweighs the extra pain. We know when the brain is in a more relaxed state the body tends to hurt less. And relaxation is helpful for coping in general. There are many different techniques for relaxation. This method involves systematically tensing and relaxing the muscle groups in your body that you can move, one group at a time. The idea is to give you an awareness of tension in your body and what it feels like to release that tension. Even simpler, you can use your breathing as a form of relaxation. I’ve even done breathing relaxation with people on ventilators before, which involves counting breaths and using this as a path toward relaxation. This can often be used in conjunction with imagery—thinking about a place that you associate with relaxation and feeling good while you are doing relaxation exercises. Practice regularly; even 30 seconds of practice is worthwhile and better than none. Develop relaxation into a habit. You are learning a new skill. You need to use it often to benefit from it. Practice relaxation even when you’re not stressed or in pain. If you have a smartphone or a web base, Breathe to Relax is a free app that will talk you through how to practice breathing relaxation. Search for "Breathe 2 Relax" online or in your app store. Yoga can provide a combination of breathing, relaxation and positive imagery skills. There are many different types; look for one that accommodates people of all abilities and experience levels. Hypnosis for managing pain (called hypnotic analgesia) in SCI is backed by scientific evidence. Several studies here in the University of Washington Department of Rehabilitation Medicine have found that hypnosis is very helpful in reducing pain in about a third of people with spinal cord injury pain. About another third say it helps some, and a third say it doesn't really help very much at all. You won’t know if you're going to be someone who benefits from it unless you give it a try. Hypnosis is a state of focused attention and use of imagery to get you into a very relaxed state. While in that state you listen to positive suggestions (from a therapist or audiotape) for decreasing unpleasant experiences and increasing comfortable experiences. Induce relaxed state by focusing attention on a single stimuli (such as the therapist’s voice). Mindfulness is simply being aware of the present moment and having a nonjudgmental attitude towards your present thoughts and feelings. This method can help people relax and be less bothered by chronic pain. There are many mindfulness resources and trainings available, including the Mindfulness-Based Stress Reduction Programs at the Center for Mindfulness in Medicine, Health Care, and Society (www.umassmed.edu/cfm). Major Depressive Disorder (MDD) is much more common among individuals with chronic pain, including SCI pain. Often pain and depression occur together, and evidence suggests that pain precedes depression more often than the reverse. It is very important that you know the symptoms of depression: feeling down and blue most of the time; having low energy; not wanting to get out there and do things, or be with others. Check with your health care provider if you think you might be depressed, because depression can make pain worse, and there are effective treatments for depression. Self-management also includes asking for help from mental health professionals trained in specific behavioral and psychological techniques. Based on cognitive behavioral theory of pain, in which thoughts and behavioral responses to pain influence adjustment and functioning. A mindfulness approach focused on allowing and accepting some pain some of the time; not fighting pain all the time and letting pain rule your life. Decreased pain intensity, psychological distress, physical disability, & attention to pain. Increased physical functioning, general mental well‐being, motivation, and engagement with daily activities. Turk, D. C., & Winder, F. (2005). The Pain Survival Guide: How to Reclaim your Life. Washington D.C.: American Psychological Association. Caudill, M. A., & Benson, J. (2008). Managing Pain before it Manages You (3rd Ed.). New York: Guilford Press. Gardner‐Nix, J., & Kabat‐Zinn, J. (2009). The Mindfulness Solution to Pain: Step‐by‐Step Techniques for Chronic Pain Management. Oakland, CA: New Harbinger. Kabat‐Zinn, J. (1990). Full Catastrophe Living: Using the Wisdom of Your Body and Mind to Face Stress, Pain, and Illness. New York: Delta. Lorig, K., & Fries, J. (2006). The Arthritis Helpbook. Cambridge, MA: Da Capo Press. Hayes, Stephen (2005). Get Out of Your Mind and into Your Life. Oakland, CA: New Harbinger Publications.